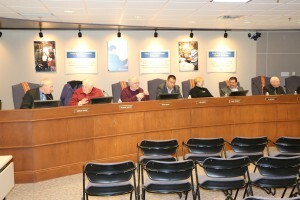 During its first meeting of the new year Perry Township School Board members elected new officers. Charles Mercer Jr. will serve as President of the Perry Township School Board for 2016. Mercer holds a law degree from Indiana University and spent much of his career working in state government positions. Chuck and his wife Ruth have 5 children and 11 grandchildren. Steve Maple will serve as Vice President. Maple is the Fitzwater Chair of Business at the University of Indianapolis. where he has taught since 1975. He also has a law degree from Indiana University. Steve and his wife Sarah have 4 sons. Ken Mertz will serve as Secretary of the board. Mertz, who graduated from Ball State and his wife Jennifer are both PMHS graduates. They have 2 children.